Are you kidding me? Woven bacon wrapped around sausage filled with crispy bacon and BBQ sauce? OMG. Bacon Explosion. Thanks to Reyhan for cluing me in to this internet phenomenon! 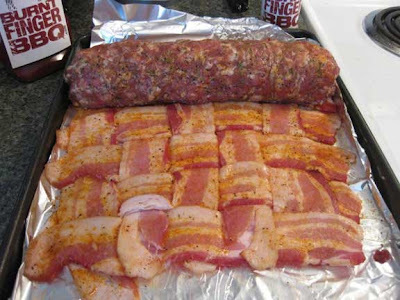 I have seen other versions of this online which involve a bacon weave rolled around cheese and more bacon!